Data for the sedimentary facies, deformation, and volcanism of the Salar de Antofalla area are integrated to put forward a model for the Cenozoic evolution of the Southern Puna. Before the beginning of crustal thickening and uplift of the Central Andes during Neogene times, the Salar de Antofalla area was part of the Andean foreland. Apatite fission track data on a Paleozoic granite intruded in Precambrian metamorphic basement reveal cooling to near surface temperatures between 80 - 40 Ma ago. The granite is exposed at the western border of the present Salar de Antofalla south of Quiñoas. We conclude, therefore, that Precambrian rocks were probably exposed at least during the Paleogene in the Southern Puna. The Southern Puna may have been part of a large region with low relief in which only minor sedimentation occurred up to the Late Eocene. Later on, the Salar de Antofalla area was incorporated into the Andean orogen. Sedimentological and tectonical features as well as geochemical data for the volcanic rocks show that the area transferred from a foreland to an intra-arc setting. Finally, it is situated behind the active volcanic front and shows geochemical features of a backarc position, but also tectonical and sedimentological attributes of an intra-arc setting. This evolution is described stepwise following the sequence of tectonic, volcanic, and sedimentary events. 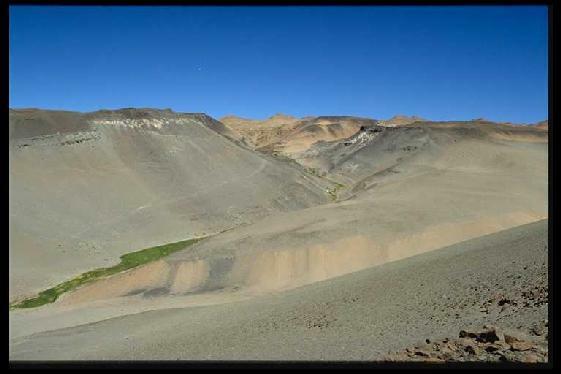 During latest Eocene to Late Oligocene, relatively uniform nonmarine clastic sediments (Quiñoas Formation) were deposited across the entire Salar de Antofalla area which represented, consequently, a coherent sedimentation area. It was presumably part of larger retroarc foreland basin whose detritus derived from the Incaic mountain belt in the west (Jordan and Alonso 1987). This orogenic belt, today represented by the Chilean Precordillera, developed during the Incaic deformation phase (approx. 38 Ma, Döbel et al. 1992) and was the site of the Late Cretaceous-Paleogene Andean magmatic arc. Due to the small amount of shortening in the Incaic mountain belt (~ 20 %) and the tectonic style (Günther et al. 1998), thrust loading may not have been the main subsidence mechanism. Subsidence presumably resulted from sedimentary loading or, as proposed by Jordan and Alonso (1987), from thermal contraction due to cooling of the Late Cretaceous-Paleogene arc. Distant magmatic activity is indicated by a few pyroclastic fall deposits. Probable sources of the pyroclastic rocks are in the Franja de Maricunga (26°S - 28°15´S, adjacent to the west of the present Western Cordillera) where intermediate volcanic and plutonic rocks of equivalent age are exposed. They represent the final products of the magmatic arc (Mpodozis et al. 1995; 36 - 30 Ma). Consequently, the Southern Puna was located east of the magmatic arc of the Early Tertiary subduction system, in the foreland. Following Pilger (1984), a flat subduction angle during this time can be assumed which would have been caused by subduction of progressively younger and, therefore, hotter oceanic crust of lower density. A change in basin geometry occurred during the Late Oligocene when large amounts of coarse clastics (Chacras Formation) were deposited. As a consequence of west-vergent reverse faulting, basement rocks were uplifted and eroded along the entire recent Salar de Antofalla. This intrabasinal Antofalla high extends over about 120 km which is indicated by petrographical and paleocurrent data (Fig. 7) as well as by the facies distribution of the Chacras sediments. Due to the basement-involved contractional tectonism, the former coherent part of the foreland basin was segmented into smaller broken-foreland basins. Tectonic shortening (D1) could have caused initial crustal thickening and uplift of the Southern Puna. Distal magmatism is documented by a few pyroclastic layers. After a pause during the Late Oligocene, volcanic activity was renewed in and south of the Franja de Maricunga (26 - 21 Ma, Mpodozis et al. 1995) and was initiated in the Western Cordillera immediately adjacent to the Salar de Antofalla area (< 23 Ma, Naranjo and Cornejo 1992). The Southern Puna still remained east of the magmatic arc. The renewed magmatism of the Franja de Maricunga, the beginning of volcanism farther east in the Western Cordillera, and the development of a broken-foreland basin occurred contemporaneously with an increase in convergence rate (28.3 - 25.8 Ma, Somoza 1998) normal to the trench due to reorganization of the Pacific plate´s motion (Pilger 1984, Pardo-Casas and Molnar 1987). Kay et al. (1988, 1991) and Mpodozis et al. (1995) inferred a subduction angle of < 30° at this time. This time interval was characterized by prevailing regional compression and the onset of volcanic activity in the Salar de Antofalla area. The volcanic arc broadened from the present Western Cordillera to the Antofalla area. The geochemical data of the volcanic rocks of the Antofalla area predominantly display an arc signature. Ongoing thick-skinned compressive deformation caused a further segmentation into basins bounded by east-vergent reverse faults in the west and west-vergent reverse faults in the east. Due to their incorporation into the magmatic arc, they are classified as fault-bounded intra-arc basins. Syntectonic sedimentation was related to the activity of fault systems indicated by progressive angular unconformities. The sedimentation also was largely influenced by the spatial distribution of the vigorously forming stratovolcanoes. As a result, the distribution of highlands and accumulation areas is obscure. According to geochemical data, the volcanic melts erupted through a crust whose thickness measured at least 40 km. This coincided with contractional tectonism and suggests that regional uplift was in progress. During Middle Miocene times, a peak of tectonic activity changed the basin configuration. Several reverse fault-bounded intra-arc basins were developed due to tectonic shortening at about 12 - 10 Ma. Syntectonically, large amounts of alluvial fan sediments were deposited. The Salar de Antofalla basin itself presumably extended to the area between the western margin of the recent Salar de Antofalla and the Sierra de Calalaste. Sedimentation patterns were mainly controlled by the position of reverse faults and thrusts at its eastern margin. Therefore, features of this highly elongated basin are an asymmetric shape in cross section as well as a wedge-shaped and unidirectional facies distribution. Volcanic activity of the stratovolcanic centers continued. A position behind the volcanic front, but within the volcanic arc is indicated by geochemical data of the volcanites. Ongoing magmatism and contractional tectonism may have caused further crustal thickening and uplift. Because arc volcanism in the Southern Puna continued, a relatively flat subduction angle could be assumed. This slab angle and the onset of contractional tectonism could have been provoked by the interaction of the San Juan Fernández ridge with the South American Plate. According to Pilger (1984), the subduction of this aseismic ridge is inferred to have caused the segment of present flat slab subduction in Central Chile (28 - 33°S). Due to its NE-strike, the ridge came into contact with the South American plate first in N Chile and then migrated southwards along the trench to its present position in Central Chile. According to von Huene et al. (1997), the San Juan Fernandez ridge passed the entire segment of flat subduction (28° - 33°S) south of the Salar de Antofalla during the past 8 m.y. Assuming the same migration velocity, the subduction of the ridge could have begun at the latitude of the Salar de Antofalla 2 - 3 m.y. earlier, consequently at about 11 Ma. During Late Miocene to Pliocene times (< 9 Ma), alluvial fan sedimentation was interrupted by a period of relative tectonic quiescence. Due to the decreased clastic input, this period is marked by the abundance of lacustrine carbonates and sulfates deposited in marginal parts of the basin. Abundance of halite and sulfate evaporation in the central part of the basin may indicate the establishment of an internal drainage at about 8 to 9 Ma. Between 6 and 4 Ma, the relative tectonic quiescence was accompanied by the eruption of a major volume of intraplate-like basaltic andesitic magmas at monogenetic centers. As pointed out by Kay et al. (1997), eruption of these centers was contemporaneous with eastward migration (~ 50 km) of the volcanic front due to an overall shallowing of the subducting slab. The geochemical data of the basaltic andesites are consistent with their position in the back of the volcanic front. Kay et al. (1994a) showed that the occurrence of intraplate-like volcanism is associated with crustal heating, a generally higher topography, and a thinner lithosphere of the Southern Puna compared with the Altiplano. They interpreted these features as a consequence of lithospheric delamination. Our age data suggest that if delamination had indeed occurred this process could have been of major importance between 6 and 4 Ma. During this stage further crustal thickening and uplift resulted from renewed contractional movements (< 4 Ma). Shortening is indicated by reverse faulting and thrusting at the eastern edge of the Salar de Antofalla (Voss in prep.) reducing the basin to its actual narrow and elongated shape. This relief-forming tectonism caused shedding of large amounts of alluvial fan deposits (Escondida Formation). Basin forming tectonic processes and distribution of large stratovolcanic centers which were mostly extinguished during the Pleistocene are comparable to the former stage. Therefore, the basins of the Southern Puna are further on characterized by an intra-arc setting. Revived tectonism was accompanied by decreasing activity of monogenetic centers (geochemically representing backarc magmas) and stratovolcanoes as well as the eruption of the widespread Vallecito ignimbrite (3.6 Ma). According to De Silva (1989), large-volume ignimbrites, like the Vallecito ignimbrite, may be interpreted as reflecting large-scale crustal melting due to crustal thickening and heating by basaltic intrusions. Today, the Southern Puna experiences a tectonically more quiet period indicated by very low seismic activity and by youngest alluvial fans that are usually undeformed.